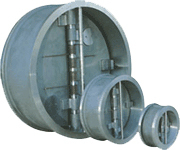 Compact Wafer Design Extremely light weight and economical compared with traditional flanged type, swing-check valve. 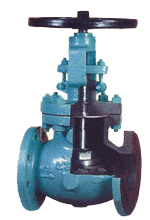 The sensitive spring incorporated in the valve closes the valve plate before reverse flow occurs thus preventing water hammer and giving complete pipe line protection even in the high head installations. 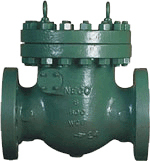 The valve is compact thus saving space and simplifying installation, and can be installed in any position and at any angle thus allowing rationalized piping layout. Dual-check valves incorporate teflon spring bearings to minimize spring wear and assure long service life. Teflon Bearings minimize friction for smooth valve plate operation.